It seems new Microsoft CEO Satya Nadella is admitting that he needs to embrace the iPad and stop fighting against it for Microsoft’s benefit. The Surface – Microsoft’s tablet-come-laptop is never going to outsell the iPad so concentrate on Microsoft’s strengths and get your software on Apple’s devices Nadella- everybody wins. The second product Philips is announcing today is “hue tap” a round mountable switch to make it easy to control hue lights without needing to access the hue iPhone app. The hue tap includes four buttons to store lighting recipes that are accessible with a simple tap. The hue tap requires no wiring or batteries and is powered simply by the kinetic energy from users tapping on the switch. The hue tap will be available in the second half of this year and will be priced at $60. No need for re-wiring of your main electrical light switch – this sounds perfect and technologically brilliant. I will be very interested to purchase one of these later this year. I am just getting into home automation and will write about my findings including Philips Hue lights soon. Multiple Attachments is clever in that it works with the Open In menu itself and Apple’s Mail app. Every time you need to send a message with multiple files in it, you can send one file at a time to Multiple Attachments using “Open In”; as you keep sending files to the app, it’ll show you their icons and names on its main screen. When you are ready to send a message with those files, hit the Share button and Multiple Attachments will bring up a Mail panel, composing a new message with the files you’ve sent to the app. Then, you only need to confirm the email account you want to send from, and you’re done. Essentially, Multiple Attachments works as a container of temporary files based on two of Apple’s inter-app communication features – Open In and Mail sharing. The app stores files until you send them (or delete them with the Trash button), and it’s clever in how it combines temporary storage with the ability to send emails outside the main Mail app. Attachments can be previewed individually, and, in my tests, the app performed as advertised, collecting files sent via Open In and sending them as a message with multiple attachments using accounts configured in Mail. It’s a rudimentary solution, but it works. Someday, it’s likely that Apple will revamp how iOS apps communicate with each other and offer a way to collect multiple files in an email message at once. Until that day, Multiple Attachments provides a simple way to send an email message with multiple files on an iPhone and iPad – it’s a small victory, especially if you work on iOS a lot every day. Nice app for us iOS power users and as Federico says, Apple are likely to build this functionality into iOS in the future, so for now this is a nice work-around. Instead, Apple is serving its digital content to U.K. customers from Ireland, where the VAT rate is 23%. With that being the case, customers in the U.K. will actually pay less VAT under the new rules, meaning iTunes and App Store prices should fall a little. In reality, Apple is likely to leave them as they are and pocket the difference — but at least prices won’t be going up like you may have been led to believe. Potentially good news! Nothing can happen until 2015 anyway but it does sound like the early reports may have jumped the gun. Members of the UK government are seeking to close a tax loophole that currently allows online music, app, and book downloads to avoid the country’s 20% “value added tax” in favor of much lower international tax rates, reports The Guardian. If the push is successful, iTunes customers in the UK will instead be taxed at the appropriate rate for their own country. However, the new law won’t go into effect until January 1, 2015, so there’s still time for things to change. Supporters of the change say that it will lead to more fair competition among foreign and domestic companies, since UK-based companies are currently at a major disadvantage due to the higher tax rate. Let’s hope for UK customers sake, that the loophole is not closed. British Apple TV owners have been longing for the BBC iPlayer on our favorite black box pretty much forever, but now we might finally know why it hasn’t happened. BBC’s Chris Yanda has outlined why they went Chromecast, and not Apple TV. One of the reasons we decided to support Chromecast was that Apple TV currently works only with Apple devices. Chromecast has SDKs available for a number of different platforms including iOS, Android, and the Chrome browser for laptop and desktop computers. iPhone and iPad owners can get a proper iPlayer experience on their TV using Chromecast. It works really well, but I have to confess to being massively disappointed, still, that it isn’t on the Apple TV. From what Yanda says, it doesn’t look like we can expect to see it any time soon. It’s still not a particularly great reason, either. The Chromecast is a totally different product to the Apple TV. It requires a mobile device or the Chrome browser to operate – even if it takes the streams directly from the content provider, not from your phone. Apple TV just sits there under your TV, whether you have any other Apple product or not. Chromecast however does mean the BBC just had to add to its existing iOS and Android iPlayer apps to enable the functionality. Apple TV would require a dedicated channel. Shine is fantastic CV/resume creation app which can make your CV/resume look polished, professional and perfect. You don’t have to worry about designing the look – the app has amazing templates to care of that, you just need to enter your information and the app takes care of the rest. When you are hunting for a new career direction or just managing your own personal files, your CV/resume is probably sitting on your computer somewhere as a Microsoft Word document and maybe has not been updated in a while. If you are not particularly confident on a computer, perhaps your CV/resume is pretty basic to look at as well with just your recent work history, interests and references. Shine changes all this. The way the app works is that you enter all the information that the app requires, then the app will take that information and apply it to a several different templates to choose from. You can even use a different template each time you want to print or share your document – without editing any of your text that you previously keyed in. 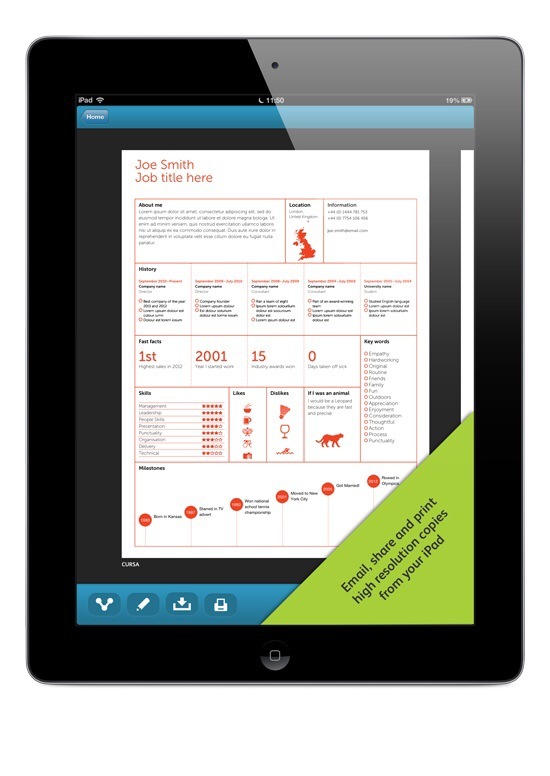 Email and print high resolution print-ready PDFs and images right from your iPad. It’s one of those apps that will stay on my iPad tucked away in a folder with my CV/Resume all ready to be shared if needed and best of all it will look miles better than the version knocked up in Microsoft Word.. The app is $4.99 and you can download it here. The change comes after the iPad 2 served for some two years as Apple’s entry-level tablet offering after the company introduced the Retina display-packing third-generation tablet and follow-up fourth-generation device. Interestingly, the reintroduction of the fourth-gen iPad makes the first-generation iPad mini Apple’s only non-Retina iOS device in circulation. Apple has priced the fourth-gen iPad at $399 for Wi-Fi only and $529 for Wi-Fi + Cellular. Both models are available in the usual black and white color schemes. Just as expected, Apple has today added a cheaper 8GB model to its iPhone 5c lineup. The handset is available to order now from a number of European carriers, and via the U.K. Apple Online Store, where it can be purchased for £429 ($714) off-contract. O2 U.K. was one of the first to add the new iPhone 5c to its online store, and its cheapest deal will see customers paying £50 ($83) up-front for a £28 ($47) contract over two years. If you want the handset for free, you’ll be paying £43 ($72) per month. As others have commented on, 8GB is really not adviseable even with cloud-based services like iCloud, Dropbox, Goggle etc. The recent 7.1 update needed 1.9GB of free space just to run – let alone those iPhone owners who have 5GB of photos and videos stored in the camera roll. Apple should be making the minimum storage space on all their devices at least 32GB, not going backwards. The possible solutions for why Apple are doing this is either because they selling the inventory off due to the reported iPhone 5C not selling as well as expected so you drop the costs of the handset by reducing the cost of the parts by lowering the storage or they simply are just wanting to target the first time iPhone buyers even more by lowering the cost a little more. 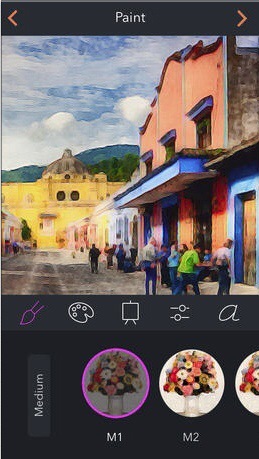 Brushstroke is a fantastic app that the iPhone and iPad has been waiting for. Essentially, you take any photo that is in your camera roll and with just a few taps, you can apply different filters over them to create a brushstroke type effect which makes your photos look like they were painted. Once you have applied a filter, you can share the photo to Twitter, Instagram, Facebook etc or save back into your camera roll to add to your own collection. The best feature is that the developers have teamed up with Canvaspop so that you can have the photo professionally printed onto canvas and shipped to your door. You can pick the frame and size that you wish, to ensure that whatever photo you choose it will look like a professional artist has painstakingly crafted the picture just for you to adorn in your home. 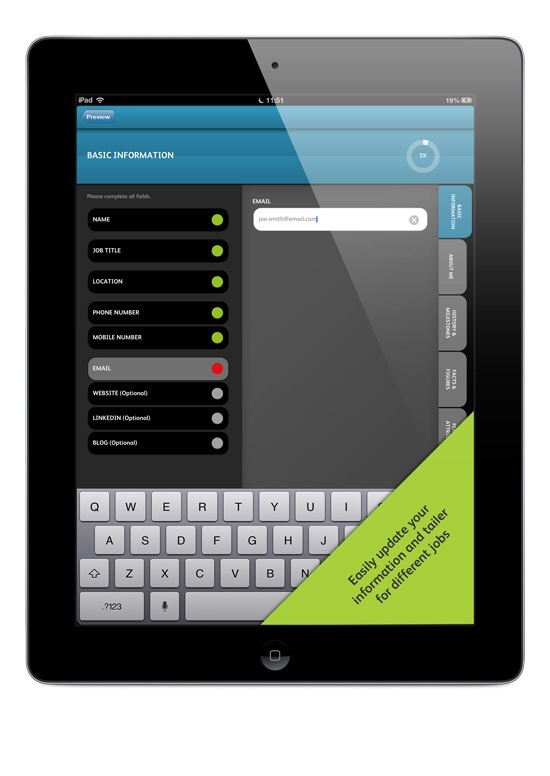 The app itself has a minimalist design with easy to navigate buttons that help you through the process. You can in theory, access the app, select a photo and within half a dozen taps, you are done – magical stuff. It’s so simple to use and is a perfect advert for a use case for the iPhone and iPad. The app is £1.99 and you can download it here.